Access 2016 offers myriad different ways to lay out and present a report — all of them complicated and unwieldy. An easier way to lay out a report is to copy it to Word 2016 and rely on Word commands for the layout work. The layout tools in Word 2016 are much, much easier to use. On the External Data tab, click the More button in the Export group and choose Word on the drop-down list. You see the Export – RTF File dialog box. Click the Browse button, and in the File Save dialog box, choose a folder for storing the Word document, and click the Save button. 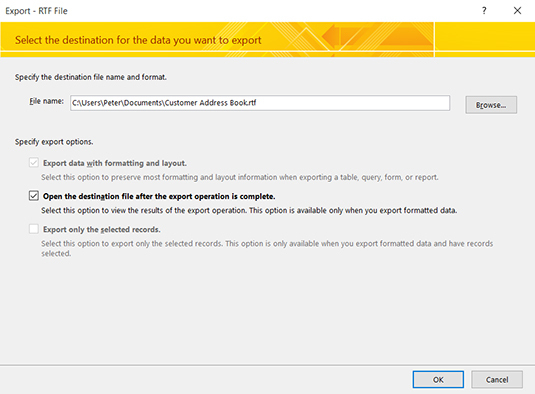 In the Export – RTF File dialog box, choose Open the Destination File After the Export Operation Is Complete. In a moment, your Access report appears in Word. The file is an RTF (rich text format) file. To save it as a Word file, go to the File tab, choose Save As, click the Browse button, and in the Save As dialog box, open the Save As Type drop-down list and choose Word Document.